We've used the Allinson dough tree to make a simple pizza base. After baking it we've topped it with yummy fruit. This is a perfect way of getting more fruit into the children's diets. Why not let the children make their own? It's all about letting them be creative in the kitchen. Mix the flour, yeast, sugar and salt in a big bowl. Mix the water and oil together, then stir in with a cutlery knife. Lightly grease the mixing bowl with some oil. Put the dough back in, cover the bowl with a clean tea towel and leave to rise until doubled in size. Preheat your oven to 240°C (fan 220°C, gas mark 9). Divide the dough into 4 pieces – keep others under the tea towel to stop them drying out. Roll a piece of dough to as thin as you can get it on a lightly floured surface. 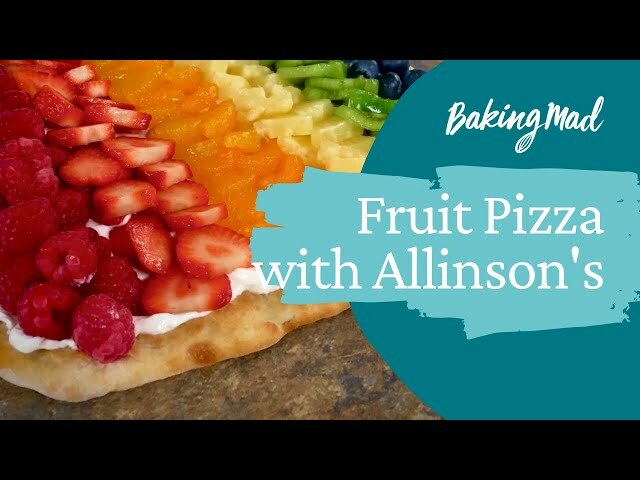 Lift carefully onto a floured baking sheet or pizza stone and finish with your favourite toppings. Bake for 10-15 minutes, until crisp and golden on top.